Khadim Ali is a graduate of the National college of Arts, Lahore, where he was trained in the traditional art of miniature painting. Of Afghani heritage, much of his work is a response to the acts of violence committed by the Taliban regime during their governance of Afghanistan between 1996 -2001. In this recent series of paintings Khadim explores the mythological invention of heroes. He references the epic Persian poem the Shahnameh (The Persian Book of Kings) which tells the story of the two legendry warrior-heroes, Rustam and his son Sohrab. His interest in this stems from his meeting with a young boy in Bamiyan during a drawing workshop that he conducted. The boy was named Rustam but was unaware of the mythic status of his namesake and associated it only with the menacing figure of Rustam-e-Parzand, (winged Rustum) - the title used by the Taliban to signify an omnipresent vigilance. The boy's drawing of Rustam depicted a bearded figure, winged and covered in fine hair. 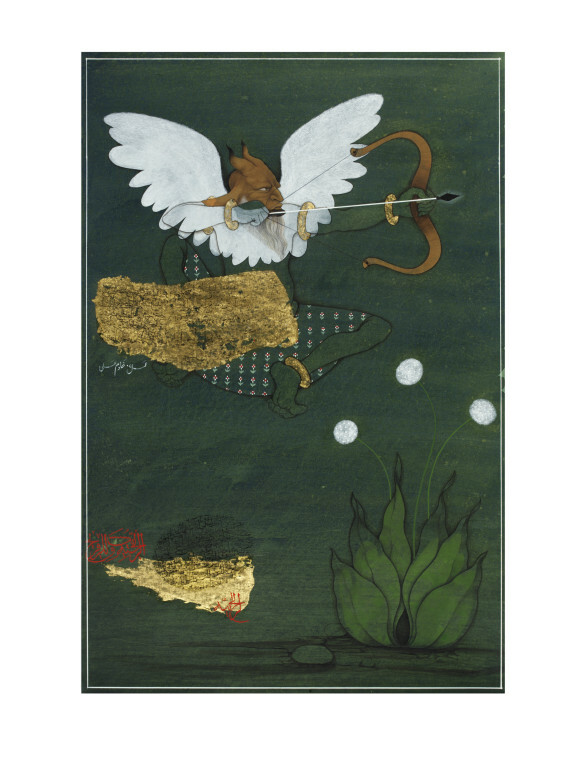 It is this which Kadhim took as his inspiration for the winged Rustam we see in his paintings. Khadim envisions Rustam as imposing and ambiguous, wavering between good and evil. 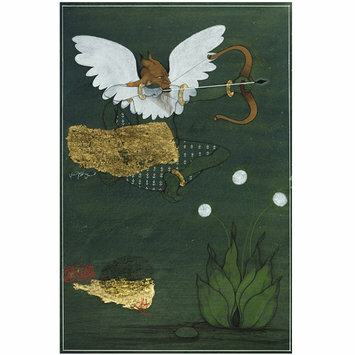 In this painting he sits with his white wings spread out behind him, evoking a sense of 'goodness' while his facial expression and his bow and arrow posed as if he is ready to fire, instil an air of menace. The figure hovers over a dandelion plant in bloom, a symbol of hope and renewal. The painting is layered with gold leaf and calligraphy, typical of this series of works. 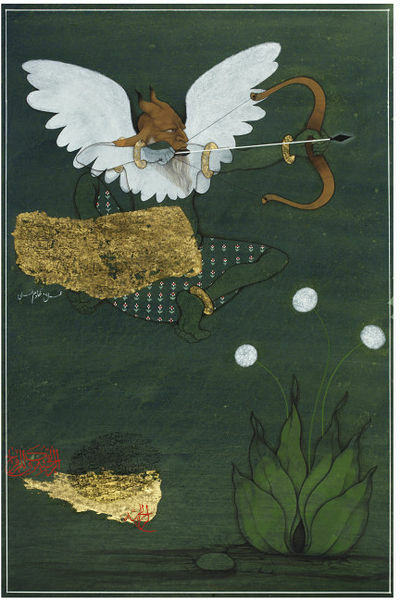 Rustam (warrior hero from epic Persian poem) is shown here with white wings and holding a bow and arrow posed as if ready to fire. The figure hovers of a dandelion plant in bloom, a symbol of hope and renewal. There is calligraphy in the bottom left hand corner. There is gold leaf acorss the lower half of Rustum and in the bottom left hand corner. Patel, Divia; Arts of Asia, vol. 45, no. 5, September - October 2015, "Engaging with Contemporary South Asia", p.84, no. 16.